German silver religious medallion, made for protection against plague (Pesttaler). It has verses from Numbers and St John on each side. It would have had an attachment loop at the top which has now broken off. The devices are Old- and equated New-Tesament types. 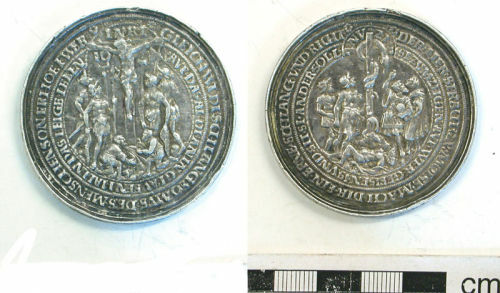 Many different types of these medals survive, some of which have various 16th-century dates whilst others are not dated. This one most likely dates to the 16th century. This find was discovered pre the Treasure Act and as such has to be looked at under the Treasure Trove. As a single, stray find it does not constitute Treasure.